Covered bridges bring to mind a bygone era; a time when the pace was slow, life was simple and people actually lived off of the land. Today steel girders replace wood trusses in modern bridges, yet remnants of the past still dot the rural landscape. And there’s no better place to ferret out these historic relics than in Bucks County Pennsylvania, which has 12 covered bridges, many of which are still in use. 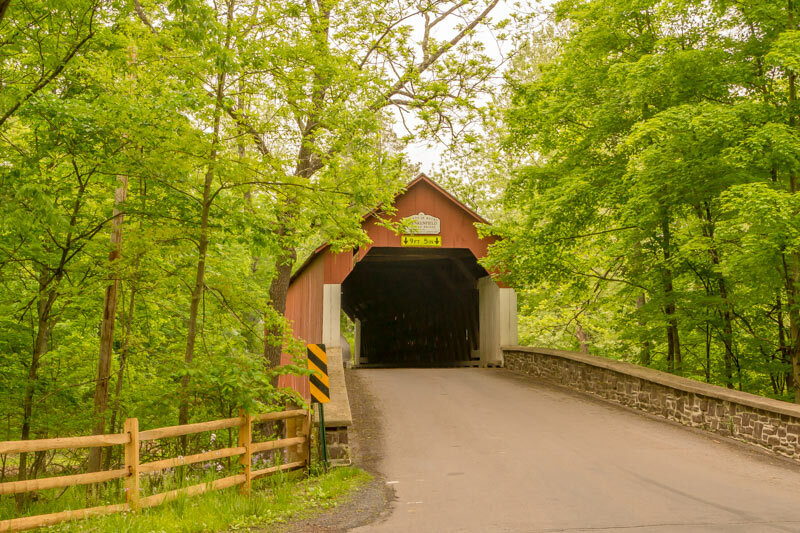 Located about an hour north of Philadelphia, Doylestown is a good place to begin your covered bridge driving tour. Not only is this the county seat, but it’s within easy driving distance of five of the more scenic bridges. Just take Highway 611 north, turn right on Stump Road, make a left on Wismer Road and follow it to the Loux Bridge. Built in 1874, the bridge is only 60-feet long, and it’s the second shortest covered bridge in the county. It’s also the only one that is painted white. Covered bridges were traditionally painted red to resemble barns, so they would be familiar to livestock, which might otherwise panic and stampede when crossing a wooden bridge. And although there’s an old concrete marker that identifies this bridge as the Cabin Run Bridge, according to state tourism officials it’s incorrect. Presumably this error was made because the bridge crosses Cabin Run Creek. To continue along on your driving tour, cross over the Loux Bridge, turn right on Dark Hollow Road, then make another right on Covered Bridge Road. The Cabin Run Bridge is about a half-mile up the road. Built in 1871 by David Sutton, this 82-foot long bridge is typical of bridges in the county, as the vertical siding is painted red. It’s also located close to the Stovers-Myers Mill Historic Site, which is worth a quick photo stop. From the Cabin Run Bridge, retrace your route back to Dark Hollow Road, drive about three miles and make a left on Cafferty Road. From there it’s a little under a mile to the Frankenfield Bridge, which crosses Tinicum Creek. Built in 1872, the bridge is 130-feet long, and it’s the most scenic covered bridge in Bucks County. Take note of how dark it is when you cross the bridge, and you can understand why these long covered bridges were nicknamed “kissing bridges”. In days of yore, they were favorite courting spots for young couples, and many a kiss was stolen on them. Add in the lack of horse and buggy traffic after dark, and you can see why it was such a favorite romantic spot. Continue along on your tour over the Frankenfield Bridge, then turn right on Headquarters Road, left on Cafferty Road and right on Geigel Hill Road. The Erwinna Bridge is located about three miles up the road. At just 56-feet long this 1832 bridge is the shortest bridge in the county; but it’s a must-see as it’s an excellent example of the lattice type construction that was used on many covered bridges. 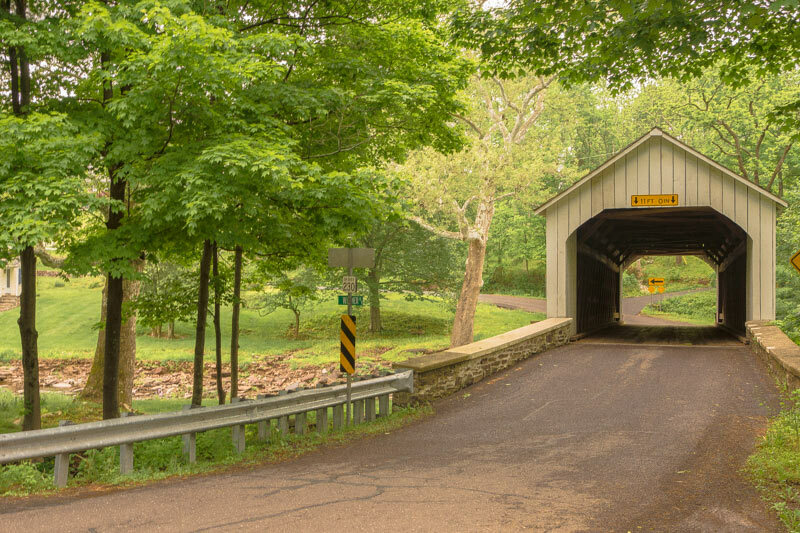 To top off your Bucks County covered bridge tour, drive over the Erwinna Bridge, turn left on River Road, go 1.7 miles and make another left on Uhlerstown Road. The Uhlerstown Bridge is located about three miles down the road. This oak bridge was built in 1832; and not only is it very scenic, but it’s also the only Bucks County covered bridge that crosses the Delaware Canal. Take some time to admire this old gem before you continue along on your journey. 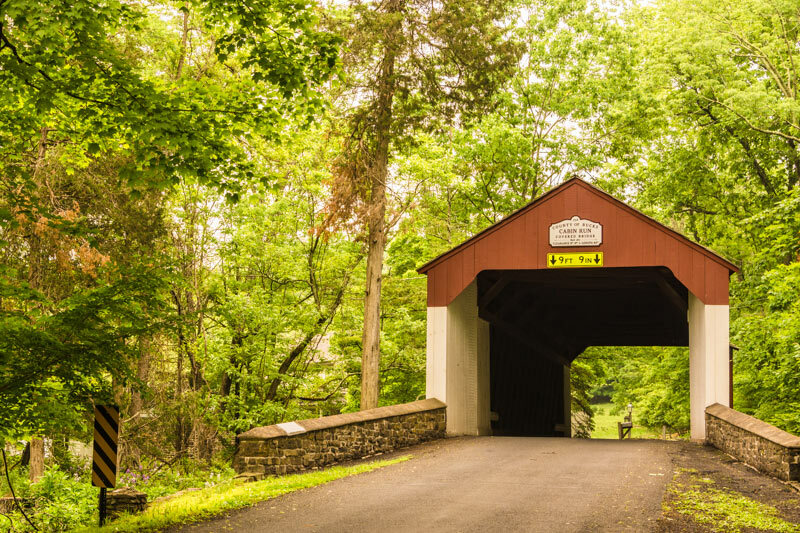 No matter what your final destination is, this Bucks County covered bridge detour is a welcome addition to any road trip.